Carino is a new hygiene chair designed to make assisted showering sessions comfortable and safe for both the caregiver and resident. It also offers caregivers an ideal working environment for hair washing, pedicure and toileting routines. Every aspect of the Carino, from the foot-operated swiveling footplates, to the swing away leg rests, has been designed in a way that combines optimum resident comfort with sound ergonomics. The high back rest provides excellent support; the reclined seating position makes the resident feel secure at all times. A wide selection of accessories is available such as a back cushion, seat cushion, bedpan and splash guard. For transfers, Carino integrates with ArjoHuntleigh active lifts. The Carino has been developed to enhance quality of life by providing a better alternative for hygiene routines in terms of safety and comfort. Assisted showering usually requires two attendants. Using the Carino means that showering and other hygiene routines can be carried out with maximum efficiency by one caregiver in a dignified way. 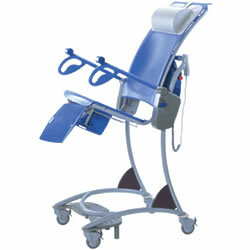 Height-adjustable hygiene chair. The resident is positioned in a tilted-back position at the top of the stroke range. Max length, highest position: 39-3/8"
Seat height: 17-3/4" - 41-3/8"
Total height of the lift, max: 65"